Still under the needle. 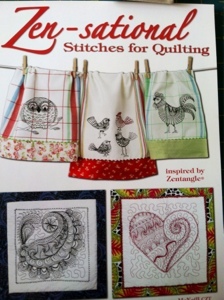 Design from my new book, you can see the heart design on the cover. I am using a signature variegated thread and have had to travel stitch over several times to build up color. It is a really good way to practice my FMQ skills. The fabric is canvas as I wanted a rough texture as the background. Once done I might add some beading or maybe bleed some textile ink into some of the sections to add interest. It's still kinda plain looking right now. So fun! 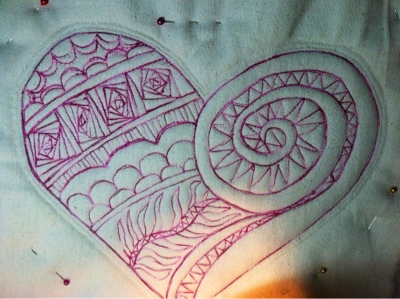 I am literally in the middle of a Valentine's Day zentangle for my husband and was wondering if I could quilt it. I think a tiny row of white seed beads around the edge to mimic lace (or very narrow real lace) would add a valentine-y effect. I would love to see your tangle after it's done! I ended up using shiva paint stick in an iridescent lavender and filled in the swirl. I may have some pink and lavender seed beads to add on. I think it's absolutely beautiful!